There's a new exhibit coming up at the Bay Area Discovery Museum, that sounds like fun. It's called Once Upon a Time - Exploring the World of Fairy Tales. It's a nationally touring exhibit, so it should be high quality. 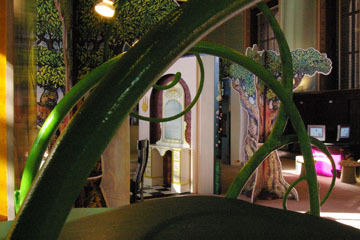 It's interactive and hands-on, bringing multicultural fairy tales to life. Kids will enter the pages of 7 fairy tales. It's designed to share different cultures and windows into other times as well, being educational and showing how fairy tales are significant. Plus, they're not all well-known fairy tales in the U.S.
You might enter a jungle, as when you enter the African Anansi (a spider)'s world. You'll cross a wooden bridge, sit on the monkey king's throne and play interactive games that show how Anansi tricked his friends. Those familar with Beauty and the Beast (ahem, everyone?) will recognize the Beast's palace when they enter, and the harpischord is available for strumming. Try on Belle's dresses in her dressing area. And lots more to do and see. Sounds fabulous! You can see more pictures here.